I got to know the Tenants’ Council in the Märkisches Viertel neighborhood through my contact with the filmmaker Max Willutzki, and I attended their meetings regularly from the summer of 1970. Together with Max, I made a documentary about preventing an eviction in the north Berlin bedroom community. Max sat next to me while I worked at the editing bench, holding forth and explaining all the background information. I laid the tracks, edited the film and did all the actual work, even the driving. This kind of division of labor helped sensitize me to further observations around gender. The Tenants’ Council was one of the few “grassroots” groups that consisted almost of exclusively of people who were affected by the issue, in this case mostly workers. The group regularly published a small newspaper informing residents of the Märkisches Viertel about the actions of the social housing association GeSoBau and the work of the Tenants’ Council. I also gained insights into the activities of social workers and psychologists in the neighborhood, and was amazed at the often close and trusting relationships that the local “problem” families had with them. The world of single mothers with many children was new to me, as it was to most students. Through these contacts I later found many women who willingly told me about the violence of their partners and the helplessness of official agencies. Violence against women was not yet a topic of public discussion at the time; the main point now was to demonstrate “the workers’ might” to the GeSoBau. That at least was what the men in the Tenants’ Council demanded and decided. The women attended all of these meetings but sat there knitting wordlessly, never speaking up. The next day, when it was time for the planned go-in at the GeSoBau and the District Office, however, not a single man showed up—but the women did. People at the film academy often spoke of the “camera as weapon.” We could not expect to gain permission to film the go-in from either the GeSoBau or the District Office. I took a video camera with me anyway to document events for the group, to back the women up and naturally to signal “public interest.” Nowadays every TV magazine program uses this method of intervention by camera, of muscling in against the will or without the knowledge of the other side. After all, image rights, which in those days still made such actions impossible, can now be evaded by electronically distorting the faces of those involved. And the video camera was not one of those handy little items tourists take with them on vacation nowadays; it was a piece of “portable” video equipment weighing 45 pounds. It would be years before the film academy warmed to this new technology. I got the camera from my anarchist contacts, from Philip (Werner) Sauber, one of my fellow students expelled from the film academy. In 1970 he had purchased the first portable video equipment in Berlin with the DM 18,000 compensation he had received. 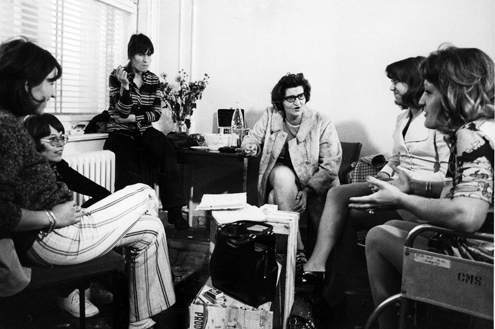 Shooting a scene of For Women – Chapter 1 – inspired by a go-in of tenants. When we arrived at the GeSoBau office the employees sprang from their chairs, gesticulating and above all ordering me to stop filming. So I removed the monster from my shoulder, clamped it under my arm and continued shooting. Now the women announced their demands with an eloquence and verve that I would never have thought them capable of, since I had experienced them only as silent knitters. They were strong, loud, furious and united. I was thoroughly impressed; I had never seen women give such a performance before, not even in a film. Feisty women did exist! I wanted to make my degree film with these women, but not only that, we would develop it together: a mouthpiece for these fantastic women, who had never had a chance to speak out before! 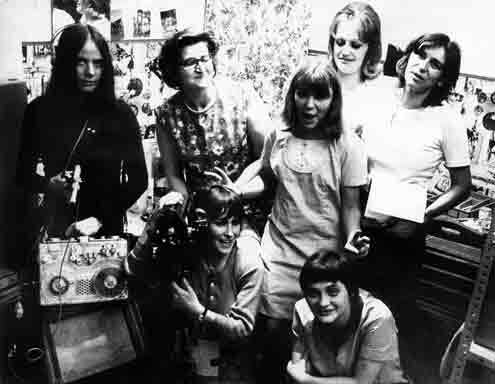 A few women from the Tenants’ Council were very keen on the idea and met with me every Sunday afternoon in the Märkisches Viertel throughout the summer of 1971. At first I brought along a dramatic idea for the film: A woman kills her own child out of desperation. The women immediately rejected this idea, and said that we should show a positive approach. We eventually ended up with the very union-oriented demand for equal pay, which the women would underline in the film with a wildcat strike. The most important thing to us was to show how women could act in solidarity with one another, since that seems to be the greatest obstacle for many women. They also wanted to address the double burden, and their problems with their men and right to personal happiness needed to be included as well. Why a fiction film rather than a documentary? There’s no love if we don’t want it. There’s no sun if we don’t see it. There’s no truth if we don’t seek it. There’s no peace if we don’t want it. but you can’t win as long as you’re alone. These are lines from the song “Alles verändert sich” (Everything Changes) by the band Ton Steine Scherben, which plays at the end of the film while the women march towards the camera arm-in-arm with cocky gestures. I had been impressed by Helke Sander’s first feature film A Bonus for Irene, which she had made the year before with documentary acuity, seriousness, wit and irony, and which showed me what feminist realism might look like in a fiction film. The pandering, crudely proletarian style of films made by leftist men around the same time, in contrast, demonstrated the full spectrum of disdain for women among men in those days. One example is Christian Ziewer’s Dear Mother, I’m Alright, in which a male worker grabs his female colleague’s breasts from behind with both hands. Was Ziewer trying to curry favor with the proletarian audience? I loved the way the women stuck together. They came from totally different classes and age groups, but it worked wonderfully well nonetheless. I had never done anything with women before. There was no competition. I found that great, that you left each individual the freedom to shape the scenes herself. We then improvised a few things and you said which was best or why don’t you do it this way. There was directing, but it wasn’t imposed on us from above. It was also fun because—and I only realize this now—there was a dynamic among the women, a group dynamic, but without any competitiveness. Was there a script at all? We all had the same experience: A woman is isolated in the family—girlfriends and neighbors can only help women with individual problems (such as childcare, shopping). But the husband’s tyranny remains taboo, and she continues to be subject to it. What we mean is that a man can do whatever he wants with his money, he doesn’t have to let his wife decide on household issues, and if the woman wants to work outside the home he can even forbid her—he can sue her any time for neglecting her household duties. These conditions are artificially maintained by deliberately underpaying and discriminating against women in the workplace. This workplace discrimination creates the basis for all social oppression of women. As a first step against private oppression, women in the workplace can join forces to fight for the recognition of their labor and for equal pay. After all, the solidarity necessary for an action can best be achieved in the workplace, where many women face the same situation. We don’t need liberal filmmakers to take on the cause of emancipation. We demand the tools in our own hands! The film encouraged me to be more independent, self-assured and self-sufficient. At the time I was a clingy housewife, while my husband wanted an open relationship, so our marriage was in serious trouble. I got a lot out of working on the film. That was when I decided to go to university. First I had to take the Abitur exam, since I had only finished the 8th grade. And my husband was incredibly supportive. This attitude came from the ’68 movement: A woman has the same right to study and so he looked after the children. We really did a good job. Edda Hertel had married at eighteen, but soon separated from her husband and was on her own with a child. 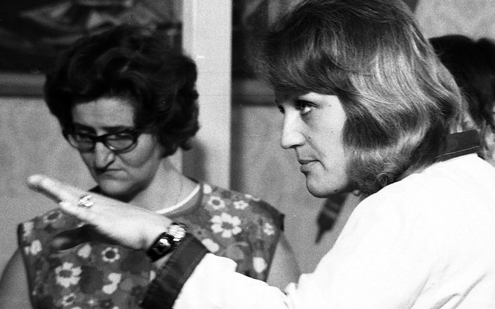 Now she began vocational training, which was possible in the GDR, became a masseuse and a medical bath attendant and later also worked in the West. She remarried, had two more children and started the first parent-child group in Märkisches Viertel. This autonomous daycare center got support from the district authority and three more of them soon followed. After we had finished our film she did her Abitur exams, studied psychology and worked as a therapist. Ulla Lange, a mother of seven, was as delighted by this collective experience as Edda had been. When I asked her whether filming wasn’t too exhausting alongside all that housework she said, “It’s like a vacation for me!” Afterwards she decided to get a divorce. [The film] is not about the matter of equal wages, which appears only on the margins. Here, a female filmmaker … quite deliberately incites anti-male sentiment among the women. … You may say, “Another guy who’s had bad luck loses his ‘victim’ and reacts with anger.” Don’t make it so easy on yourself, though. I have arguments that you and those like you cannot simply dismiss out of hand, and which need to be taken seriously. My competence comes from being a working man. Whenever there is an action, I ask “Is it good for my class?” Applied to the film, it clearly shows that it is anti-working class. It does not show the necessity of solidarity, which also applies to relations between the sexes, but quite consciously promotes and propagates the division of the working class, which is needed to maintain the capitalist order. The filmmaker… uses superficially politicized and therefore frustrated working-class women who are unable to see through the underhanded manipulation of a bourgeois intellectual. That would be my analysis of the film. I would also like to note that I have neither seen the film nor been involved in its intellectual development…. You write, “Seven women developed the topic. Three behind the camera, four “genuine ones” in front of the camera. Mothers of fourteen children.” You can’t just cite the fact that one of the women alone has seven children and that she of all people decides to get a divorce after working on the film. And if you present that as an example of political work, let me assure you that even the most uneducated and unaware working man can see just how anti-working class such a shoddy effort is. 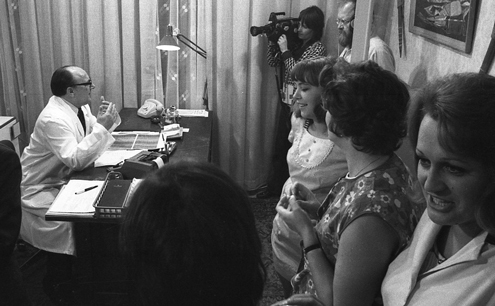 The film is an important contribution to activating women politically and represents a step towards women’s liberation in the media field itself. The film… combines an immediacy of observation with a formal mastery of film devices. The reciprocal learning process between the auteur and the collaborating women is tangible in the resulting film. The work on the film sets in motion a learning process, the film becomes the impetus for politicization: This is precisely what makes For Women—Chapter 1 typical of an evolution towards the political film—or to be more precise, towards an understanding of the political functions and the political possibilities of film. What we need: — Trained women — Means of production — Money — Airtime Because we women finally need to provide an appropriate response to these inhumane productions of the male film establishment! We don’t want to be the “singing seal” in the broadcasting program, we want to be able to produce what we think is right, and in order to do that we need to organize. No woman should be surprised anymore at how she is treated at work or at home if she cannot see that television and the film industry are her worst enemies, and she does nothing to stop these slanderous film productions! The box brought together all those women TV producers, filmmakers, film editors, photographers and journalists who had been battling alone up until then, and they began to build networks. Our film also encouraged women in the media because it was made by a team of women, which was unheard-of in the film industry in those days. We had only used a man for the lighting, Skip Norman, a black American who, as soon as the lights were set, went back to reading Eldridge Cleaver’s Soul on Ice (1968). Because of his conviction as a black man he was one of the few male film students who didn’t torpedo our efforts at emancipation. Screening before fifty housewives who took the initiative during the action Air and Sun for Children and now meet every week. The women expressed themselves very spontaneously and with a wide range of opinion. Helga [Freyer] stood up there and absorbed everything with her broad bosom and her loud voice, she really threw herself into it. Edda sat on a table and acted as moderator, and when the women started to complain about all the difficulties that might arise when trying to establish parent-child groups Edda really got going and quickly told them how she had solved the problem. We were all openmouthed. The guy from the Senate [Berlin state government] who oversees the Air and Sun for Children program and hires the women or doesn’t renew the contracts was there too. He misspoke, which he greatly regretted; when he did, the women found out that the Senate funds were going to be cut and women laid off. This guy commenced speaking and said, “Well, unfortunately I’m a man, but I think that this film does not depict the problem properly because… bla…bla…bla… etc.” Then the women said that the whole situation shown in the film definitely applied to the women present, since in a certain sense dismissals were pending… Not that the Senate guy responded to this. He started talking about the role of woman in society until we all realized what a windbag he was, and that he was there representing business pure and simple and was well versed in using “emancipation talk” to keep the facts from women. For me, this shows once again that we need to speak about concrete demands, then we can pick up everybody. Valeska Schöttle did not adopt a central aspect of the new concept—developing a film together with the women. But she and I shared the pleasure in humorous scenarios, and later supported one another in our efforts to write screenplays that resisted the usual dreary left-wing earnestness, but nobody wanted that in those days. Based on her work in a theater group close to the Socialist Unity Party of West Berlin (SEW), even she, however, seemed to think that only struggles in the productive sector were worth filming, and not the personal experiences of group members. The concept of developing scripts with the people affected by an issue and having them play the roles was one I also used later in the production of The Power of Men is the Patience of Women (1978). This feature film about domestic violence was made with very modest means, but it proved a box-office hit in Germany and had international distribution. The topic of “lesbian relationships” was always interesting! I asked you whether you had every slept with a man. You said no. Then you can’t know what it’s like, I said. Then you said, have you every slept with a woman? No! You see, then you can’t know what it’s like. You were all nice. The first lesbians who played a role in my life because I liked Traudie [Waltraut Siepert] and you. I found it fascinating. After the film [For Women—Chapter 1] some of the women tried to loosen their chains and live better and freer lives. Their husbands were not pleased and made a huge fuss. Where were these women supposed to go to get advice and practical help— not just people telling them “emancipate yourselves!” This sad experience of not being able to help them as just one inexperienced person after contributing to their politicization made me feel bad about “inciting” them in the first place. First we needed a strong team to bear responsibility and back everyone up. Hence our efforts to found the women’s center.